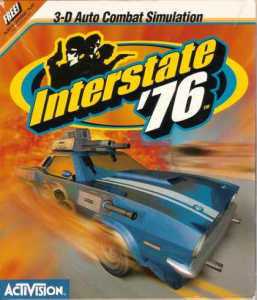 It’s episode 32 we’re talking the groovy 1997 Activision game, Interstate 76. DoubleFine Productions has announced two new game projects backed by IndieFund. Fans of Total Annihilation should check out Planetary Annihilation, now in early access alpha on Steam. Some more news about Jane Jensen’s Mobeius project has come to light. The last Larry backer up went out stating the game will be shipping very shortly, on schedule for their revised date at the end of the month. Finally, the Retro Game Music Bundle contest is ongoing. Just drop an email to podcast@umbcast.com with the subject “game music bundle”. I’ll randomly pick an entry on the next show. Now on to the main topic of the show, the vehicular combat sim, Interstate 76. We talk all about this under appreciated game. Next time, we’ll be talking pirates with Monkey Island. I have to admit that I was no more than mildly interested when you announced this episode, Joe. Interstate 76 or 67 or whatever? Never heard of it!! Nonetheless, with your podcast, with the clever use of sound clips from the game, your compelling summary of the story, you’ve definitely piqued my interest!! Congratulations! To me, that’s even more amazing and more praiseworthy than making a great podcast about a game I already know and love. You’re definitely doing something right, keep it up!! Thanks! It’s certainly a hidden gem. Frankly I can’t even remember what initially compelled me to buy it back in ’97, but I’m glad I did.